Fire Insurance ‘Plan’ or ‘Map’ ? Many people mistakenly refer to Fire Insurance Plans as Fire Insurance Maps. We can understand this by considering that the map of a country is made to a very small scale. While the plan of the building or neighbourhood is made large and large scale is chosen for that. Therefore the basic difference between a plan and a map is that of scale. SECONDLY: A plan tends to be used for things that will be worked/changed in the future. A map depicts only features when the map was generated. THIRDLY: A map is a visual representation of an area—a symbolic depiction highlighting relationships between elements of that space such as objects, regions, and themes. Plans are a set of two-dimensional diagrams or drawings used to describe a place or object, or to communicate building or fabrication instructions. Usually plans are drawn or printed on paper, but they can take the form of a digital file. FOURTHLY: Although most commonly used to depict geography, maps may represent any space, real or imagined, without regard to context or scale; e.g. Brain mapping, DNA mapping, and extra-terrestrial mapping. Plans are often for technical purposes such as architecture, engineering, or planning. Their purpose in these disciplines is to accurately and unambiguously capture all the geometric features of a site, building, product or component. Plans can also be for presentation or orientation purposes, and as such are often less detailed versions of the former. The end goal of plans is either to portray an existing place or object, or to convey enough information to allow a builder or manufacturer to realize a design. FIFTHLY: Many but not all maps are drawn to a scale, allowing the reader to infer the actual sizes of, and distances between, depicted objects. A larger scale shows more detail, thus requiring a larger map to show the same area. Plans are usually scale drawings, meaning that the plans are drawn at specific ratio relative to the actual size of the place or object. Various scales may be used for different drawings in a set. For example, a floor plan may be drawn at 1:50 (or 1/4″=1′-0″) whereas a detailed view may be drawn at 1:25 (or 1/2″=1′-0″). Site plans are often drawn at 1:200 or 1:100. SIXTHLY: To communicate spatial information effectively, features such as rivers, lakes, and cities need to be labelled. Over centuries cartographers have developed the art of placing names on even the densest of maps. Text placement or name placement can get mathematically very complex as the number of labels and map density increases. Therefore, text placement is time-consuming and labour-intensive, so cartographers and GIS users have developed automatic label placement to ease this process. Because plans represent three-dimensional objects on a two-dimensional plane, the use of views or projections is crucial to the legibility of plans. Each projection is achieved by assuming a vantage point from which to see the place or object, and a type of projection. The oldest Fire Insurance Plan of Vancouver ! Below is an excerpt of the oldest Fire Insurance Plan of Vancouver. It is dated August 1885 and was published by the Sanborn Map Company. A note on the full plan states: NO steam & NO hand engines; NO independent Hose Carts; Water Facilities: NOT GOOD. 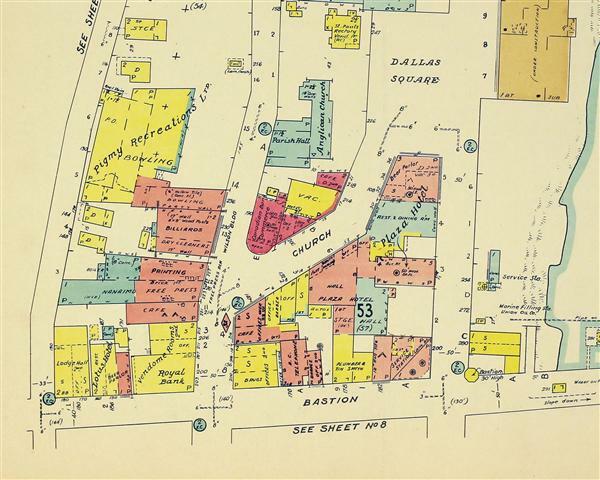 The Great Fire of Vancouver occurred on 13 June 1886, less than a year after this plan was made; Every building in this plan would have been destroyed by the fire ! 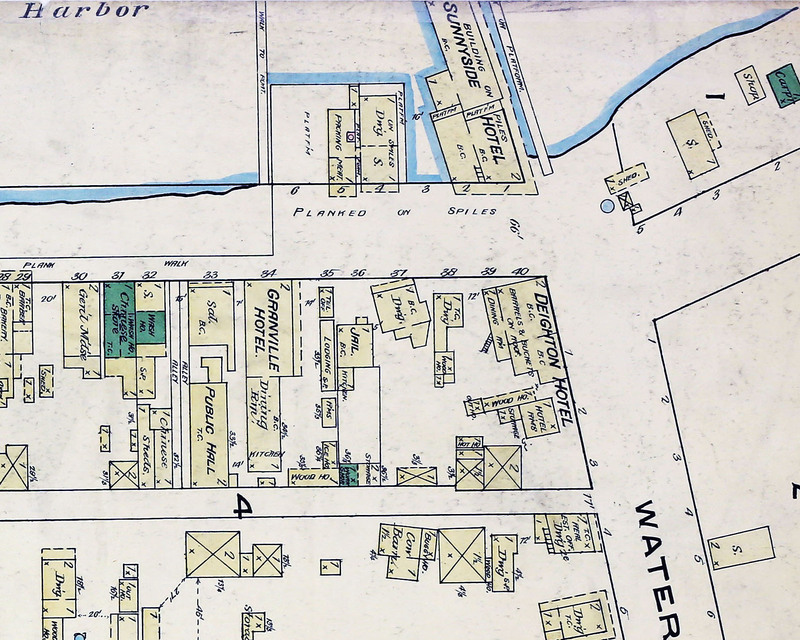 NOTE: Water Street on the plan is the present Carrall Street and the main E-W Street is the present Water Street. Fire Insurance Plans can be humourous as well as informative ! 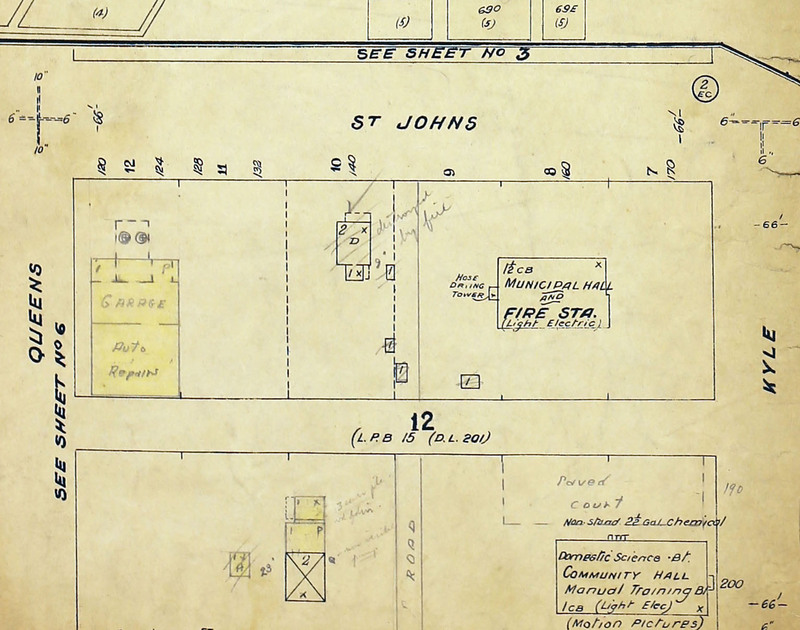 Below is an excerpt of a 1937 Fire Insurance Plan of Port Moody, showing the south side of St. Johns Street between Queens Street and Kyle Street. Note the location of the Fire Station ! Click on image for a larger size. Fire Insurance Plans – Politically incorrect ?